For those of you egg free folks who looked longingly at my breakfast suggestion of eggs, wilted greens, and salsa in the morning...here is a great option for you! You can still start your day with 2 cups of wilted greens, a generous serving of salsa, and any fresh sauteed vegetables of choice that are quickly warmed in a pan with an Organic Southwest Veggie Burgers in place of eggs as your protein source. Here you can create a breakfast burrito by wrapping all of these delights in an Ivory Teff or Brown Rice Tortilla Shell. 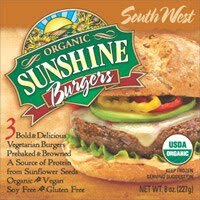 I love the hint of spice and rich flavors that come through in one of these bean veggie burgers, but what's even better is that they are all natural, gluten free, dairy free, egg free and 9 grams of fiber and 6 grams of protein to balance your meal! If your breakfast burrito is a little sad without a dairy binder, you can smooth in 2 tablespoons of homemade guacamole, or a bit of veganaise to help balance the tang of the tomato. Enjoy your easy breakfast packed full of nutrients as you start your day.